How can I connect my HW-K950 to my TV using an HDMI cable? ARC (Audio Return Channel) allows TV's with ARC capabilities and capable devices to transfer audio back and forth using one HDMI cable. Important: The TV must support ARC for this function. 1. 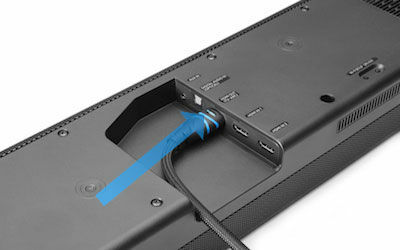 Connect one end of the HDMI cable to the HDMI OUT (TV-ARC) port on the bottom of the soundbar. 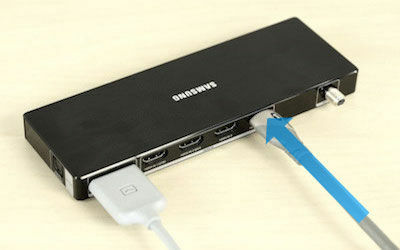 For this demonstration, a Samsung TV with OneConnect will be used. 2. Connect the other end of the HDMI cable to the HDMI IN (ARC) port on your TV (OneConnect). 3. 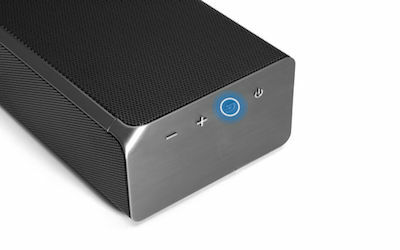 To turn the soundbar on, press the Power button on the soundbar or the remote. 4. TV ARC will appear on the soundbar's display. Note: If the soundbar does not produce any sound, press the Source button on the soundbar or remote and set the soundbar to D.IN mode. The soundbar will automatically change to TV ARC mode. If the soundbar does not change modes, check the cable connections. ● HDMI is an interface that enables the digital transmission of video and audio data with just a single connector. ● If the TV provides an ARC port, connect the HDMI cable to the HDMI IN (ARC) port. ● We recommend you use a coreless HDMI cable if possible. If you use a cored HDMI cable, use one whose diameter is less than 0.55 inches. ● Anynet+ must be turned on. ● This function is not available if the HDMI cable does not support ARC.